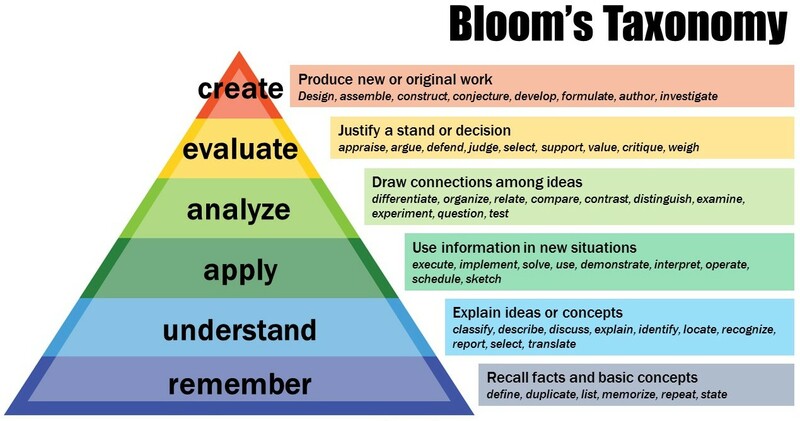 Bloom’s taxonomy of learning is a handy reference point. Is the assignment designed to evaluate understanding or is it a higher-order skill, related to analysis, comparison, or application? Short assignments probably expect only one of these aims, while longer ones might require a combination. When students understand the purpose of the paper is analysis, for example, they will realize that large chunks that are nothing but descriptive should be cut or trimmed. Knowing what to write often begins with knowing what to leave out. The five-paragraph essay refuses to die, even though it exists almost solely in classrooms. (I don’t recall ever seeing one in the wild.) It might be a convenient tool to help students understand the basic purpose of academic writing, but it should not be an end unto itself. Why we expend so much energy getting students to master a form that they will never be asked to replicate (even if they become academics!) is beyond me. Students need to know if they are free to break free from its shackles. If not, asking might make instructors who insist on using this format consider other approaches to improving student writing. 3. Can I write on something else? There are many reasons why a professor would want to assign a common topic. Sometimes it’s not to limit student choice, but to help students know what to write about. That said, if a student has an interest that is consistent with the objectives of the assignment, students should inquire about the possibility of writing on that, instead. It shows curiosity, initiative, and self-direction, which should be encouraged as much as possible. 4. Can we work on this in class? Far too much time in class is wasted on things that could be done before class—having a professor walk through a textbook chapter, being the most egregious and perhaps the most common. It would be far better for students to do the prep before class and work through the more difficult material or activities when they can easily receive help. This is called “flipping the classroom,” and there is a some preliminary research showing it to be effective. Even if an instructor is uncomfortable, unwilling, or unable to flip an entire course, merely spending one class period on a writing workshop will help students immensely. Students will learn a lot about the professor’s expectations from getting immediate and direct feedback, and professors will learn a lot about what students need by watching them work. 5. Can I meet with you to talk about my paper? Professors have strong opinions about drafts. Some require them, to avoid having to assign grades and give feedback on a pile of dreadful papers. Others avoid them like the plague, not wanting to grade everything twice. But even professors who refuse to look at drafts will almost always offer an office consultation. This is even more valuable—to get direction on a thesis, evidence, or the organization of ideas. Advice on introductions and conclusions are also essential to writing a good paper (and getting a good grade). Relatedly, students should get in the habit of having their colleagues read their writing. That’s what academics do. Self-evaluation is one of the hardest things a writer can do, so it shouldn’t come as a surprise that students are not great at it. What’s more, presenting writing as a social activity can go a long way to having students understanding writing as process, rather than product. 6. Will you give us feedback on revisions? Professors sometimes give credit for revised work, in attempt to have students take their feedback seriously—as opposed to merely looking at the grade and going back to Snapchat or whatever fun thing they were doing. What students ought to really be doing is revising work—even without the credit. This is the opposite of extra credit—gasp! What better way to let the professor know that you are serious about improving as a student. And since the revised paper will not be part of a pile, the quality of the feedback the student is likely to receive will be much greater than it otherwise would have been. 7. Can we use contractions? Let me close with one minor stylistic pet peeve: the prohibition against contractions. There lurks in many college classrooms a nasty prejudice that somehow formal writing is stilted writing, with contractions being the worse offense. Contractions are not a sign of poor writing, but not using them is a barrier to appreciating the natural beauty and flow of the written word. If you’re not convinced, go watch the Coen Brothers 2010 remake of True Grit. It’s painful. No one talks like that, so no one should write like that. In one activity, I have my students select an article from The New Yorker, The Atlantic, or The Economist and offer an observation about the writing style. (There are contractions aplenty.) After spending semester after semester reading b textbooks (where language and excitement goes to die), they are stunned by how alive the prose is. “Can we write like this?” one student asked. “Not yet,” I responded.